The Doon Pioneer Park, Grand Hill Village and Pinegrove Community Associations will host an All Candidates election meeting for citizens in the new electoral riding of Kitchener South Hespeler on Wed October 7 from 7-9pm at the Waterloo Region Museum (10 Huron Road, Kitchener). Doors will open at 6:40pm. Candidates invited to the meeting include: Conservative candidate Marian Gagne, Green candidate David Weber, Liberal candidate Marwan Tabbara, Libertarian candidate Nathan Lajeunesse and NDP candidate Lorne Bruce. The forum will be moderated by Deer Ridge Community resident, Carl Zehr. 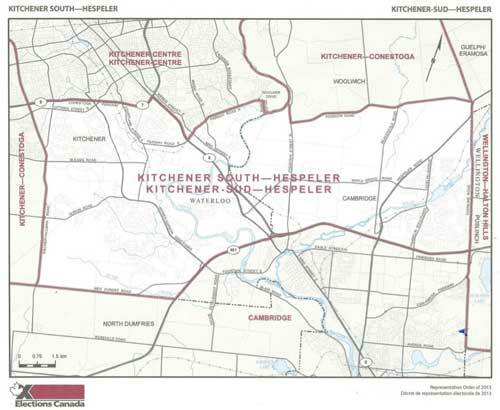 The new Kitchener South Hespeler riding has boundaries as shown in the Elections Canada map shown below. We hope you will take advantage of this meeting to meet the candidates in the new riding and ask any questions about your concerns.